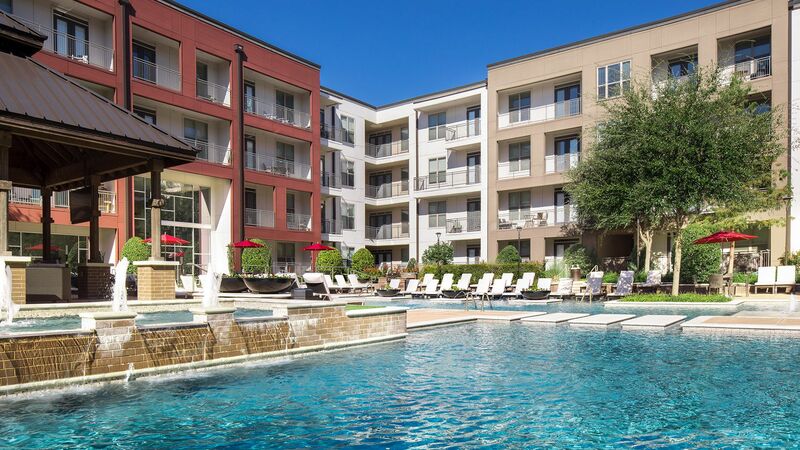 Strata, Dallas' newest address in the urban core, presents luxury apartment homes positions for spirited living. Strata places you at the center of endless possibilities with pedestrian access to some of the metros most desirable dining, shopping and nightlife. I have no complaints at all. I love the package delivery and how quickly my maintenance requests are resolved. The elevators are down almost constantly. The office staff is not as friendly as previous communities I have lived at. The apartment features and amenities are the best! Everything is kept up so well! The amenities are good but there is lack of positive reinforcement to the residents by the staff. Examples: There are trash shuts on every floor, yet the residents always pile their garbage, dog feces, and moving boxes outside of the elevator by the walkway in the parking garage. Not only does it smell horrific, the ground is stained giving the property a 'run down' appearance. So instead of holding the residents accountable for placing trash in the designated area, the maintenance staff is left to clean up after the residents. Residents do not respect quiet hours. At times residents play loud music in the later part of the night. To send an email to residents reminding them of "quiet hours" or having respect for neighbors would be helpful. Too expensive for the surrounding area. The area is still up and coming and the rent should be lower for that reason. I have been in scary situations walking my dog around the building. For this reason, I would not recommend that anyone rent in this area until it is completely built up. As a senior citizen, we know that apt. living is primarily for the younger crowd. But having said that, we are all humans and we all deserve the respect of others. If some of the parents of these younger folks knew what they were up to they would be concerned. However, one-on-one, the younger residents I have met are very nice and cordial. I was young once, so I understand!!!! Thank you for the feedback! Please continue to notify the management office if you feel there are any noise concerns and we will address the issues as quickly as possible. The concrete stair wells could use cleaning. Tenants leave food and it sits and spoils over extended periods of time. Also, a treadmill in the gym isn't working. The treadmills are popular in the gym so if someone is on the other 2 treadmills, a repaired or replaced 3rd treadmill would be useful. Also, the door in the mailroom isn't working so if you go and get your mail; you're trapped in the mail room and you have to walk around. If these things were fixed, I would more likely recommend this apartment community. Hi! We have the mail room door repaired and are working with our fitness contractor to repair the treadmills and keep them working at all times. Our service team does their best to keep the community clean at all times - we will keep a better eye on the stairwells. Thank you for the feedback! See previous comments with parking and elevators. Thank you very much for completing your survey regarding your living experience here at Strata. We appreciate and value your feedback and will continue to utilize these to improve our service. Unfortunately we have had some issues with the elevators recently and we are continuing to improve them to minimize these in the future. Additionally, we are taking steps to minimize any overcrowding of parking in the garage. Please feel free to reach out to us directly if you need any assistance and we sincerely hope you are able to continue to live with us! I would be honest with them on how thin the walls are. If that doesnt bother them then the place isnt bad. We appreciate and value your feedback and will continue to utilize these to improve our service. We can assure you that STRATA was constructed with the highest standards and meets or exceeds building code. However, we do understand that at times some neighbors may be a little more loud than others. I would invite you to please reach out to the office and we will be happy to look into your complaint directly and see what mutual remedies we can craft together! Way too expensive for living in these conditions. We are sorry to hear that you did not find the value of living here at STRATA to be a good fit for you. I know that we have discussed this prior and we wish you well in your new home!